The European ‘Sultans of Sprint’ race series is open to anyone with an air-cooled European twin and a penchant for insanity. 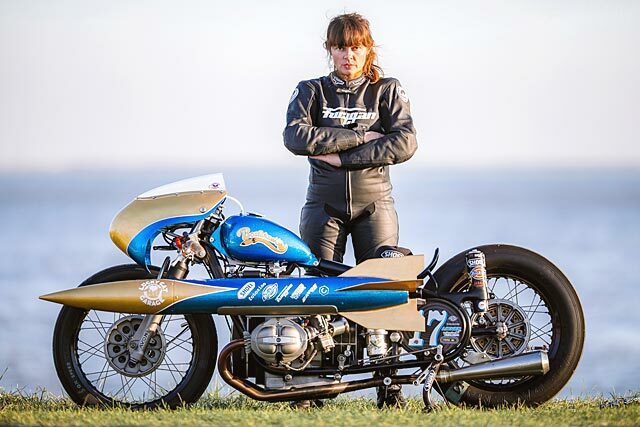 Rather than just awarding points for running the quickest time down the short-range drag strip, extra marks are given for bike presentation, hair-raising moments on the track and how much the support crew drinks the night before the race meet. 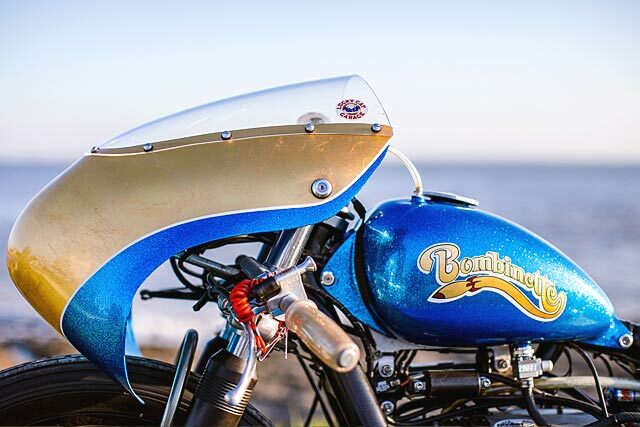 Having another crack at the title is France’s Lucky Cat Garage with their incredible Boxer-powered custom dubbed ‘The Bombinette’. About now is when we’d mention what year the Bombinette is, but with this particular build it’s damn hard to do. It’s powered by a cacophony of parts from across the BMW range, assembled by the wunderkinds from Edelweiss Motorsport in Germany. R100GS heads are mounted to a R100RS crankcase with lightened and modified pistons, valves, rocker arms, pushrods, cams and crankshaft… you name it and it’s been messed with. But best of all it runs a nitrous oxide ‘wet’ injection system. 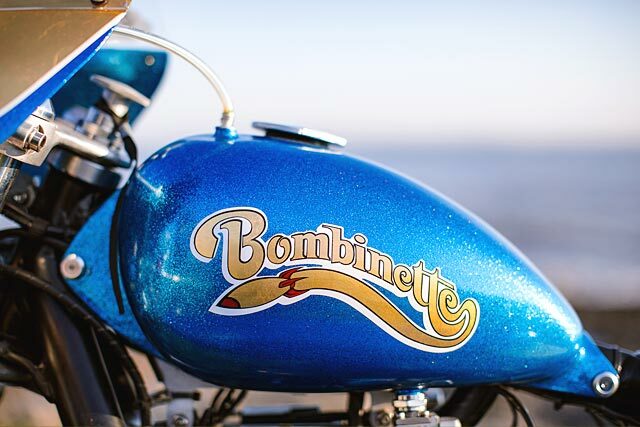 It gives the Bombinette an extra 30 horsepower for a few terrifying seconds as it hurtles down the strip, watched by scores of boozed up Frenchmen. 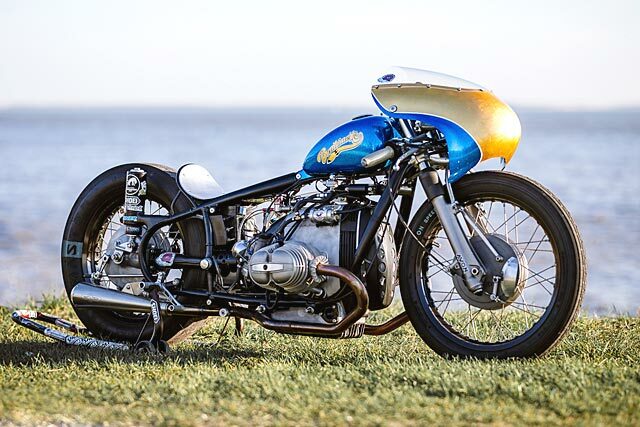 The bike’s helped along by Dellorto carburettors and a 2-2 Hattech stainless steel exhaust – all in all, this ol’ beemer puts out 140 horses. The mish-mash of components that make up the engine continues with the frame. 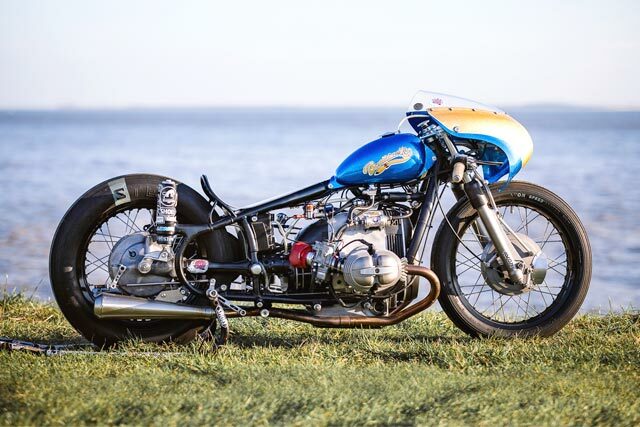 It’s a modified BMW /2 model from the 1950’s that uses a shortened /5 set of forks rescued from a 1970’s model. All the tabs and brackets have been ground down in an effort to shed weight, and plenty of material has been taken from the hubs and brake assemblies. All told, the Bombinette steps into its corner at around 170 kilograms (375lbs). 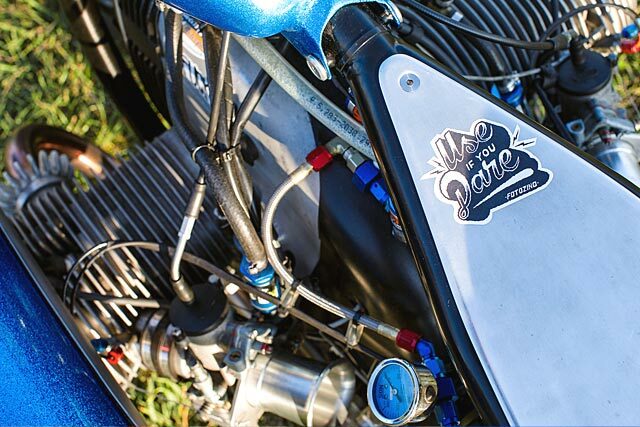 As great as the engine work is, it’s the aesthetics that really kick this bike into the next gear. 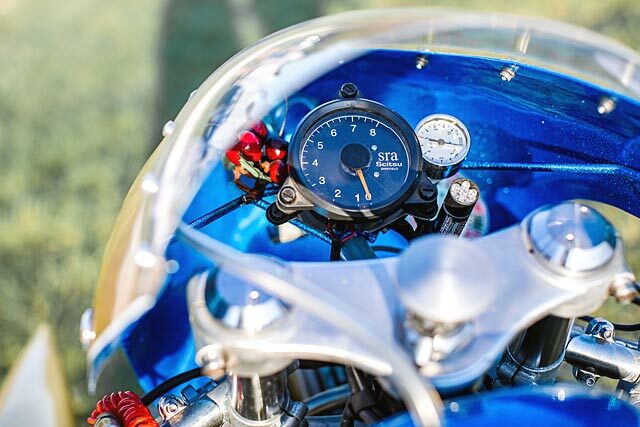 The streamliner comes via Airtech and the peanut gas tank was purchased from Lowbrow customs. 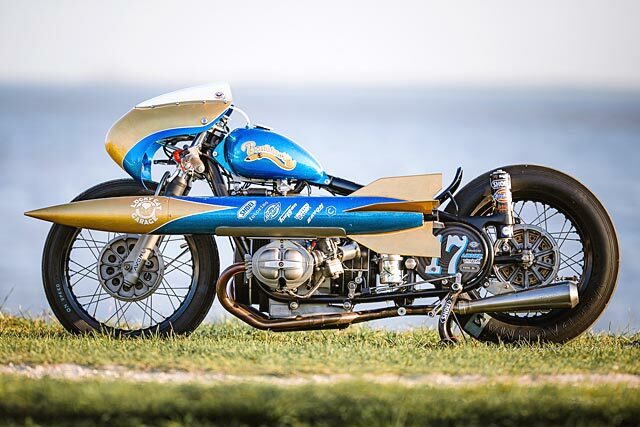 This combination puts the bike in some weird, wonderful territory between drag bike, bobber and 50’s British sprint racer. But it’s the paint that truly sets the Bombinette apart. Hell, there’s an entire video about the process they went through with Michel from R-M Paints to decide on the colour. The distinctive blue was created by mixing 7 different types of flakes to form ‘Bombinette Blue’. It’s all topped off with – wait for it – 23 carat gold leaf details. It’s also important to mention that the missile was for display purposes only and was disarmed and stored safely while the bike was being run on the track. You’ve gotta chase those extra points for creativity! So how did it go at the Sultans of Spring? Piloted by Laurence C., the bike managed to reach fifth overall. It also took out the ‘Style and Engineering’ award with the ‘get your pit crew blind drunk the night before’ going to another team (I have nothing to confirm this, but I’m guessing it’ll be some guys from Eastern Europe). 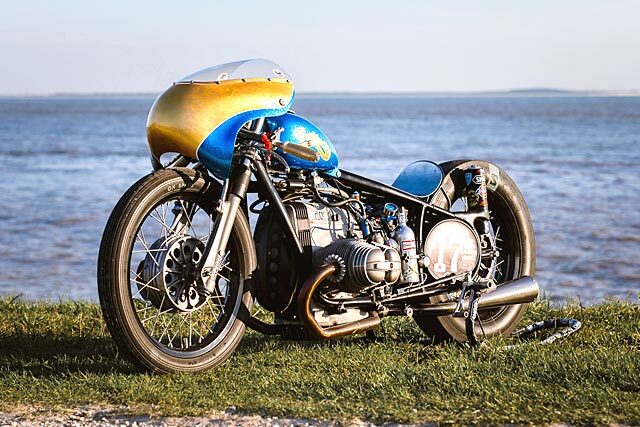 “the Bombinette performed even better than their last BMW build, thanks to a little more trimming and a hell of a lot more nitrous”. 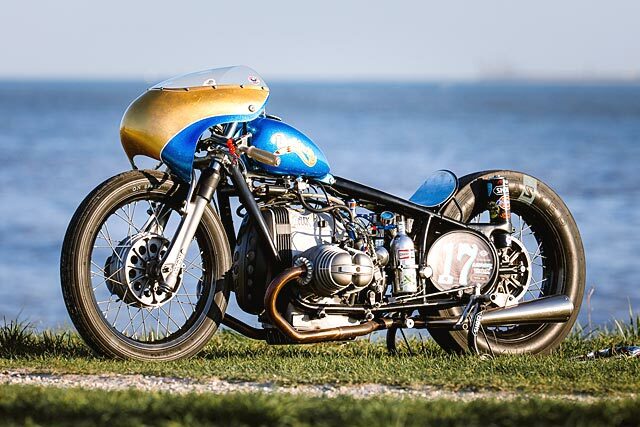 The team is absolutely delighted with the result, with the Bombinette performing even better than their last BMW build, thanks to a little more trimming of the frame and engine and a hell of a lot more nitrous. We truly cannot wait to see what the team wheel out next year!